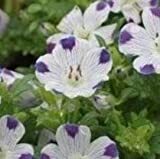 Nemophila maculata growing herbaceous of the genus Nemophila also known as Baby blue eyes, Nemophila maculata annual plant, used as ornamental ground cover plant, can grow in temperate, subtropical or mediterranean, climate and grow in hardiness zone 3-10. Leaves color green in pinnatisect shape. 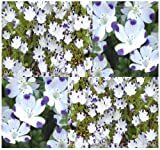 Flower color white to light purple with blue or purple spots in bowl shape with 5 petals.